Durable 12 gauge steel shelves, 3/16â€� thick angle corners, and 12 gauge caster mounts for long lasting use. Top Shelf height - 38â€� add 4â€� for full pneumatic casters. 14 gauge sides, lockable handle on 12 gauge doors (keyed alike with 2 keys). Overall height - 58â€� (62â€� with full pneumatic casters). Louvered panel (angle frame) - 19â€� x 36â€� that accepts different sizes of plastic bins. 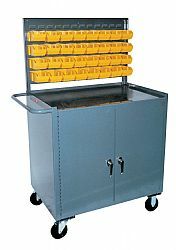 Includes 32 yellow plastic bins (3â€�h x 4-1/8â€�w x 7-1/2â€�d).